One of the pioneers of the UK’s flourishing gin scene, the award-winning Darnley’s View Gin, has today (Wednesday 29th March) announced a raft of exciting changes in advance of plans for ambitious growth in 2017. Launched in 2010 by Edinburgh-based Wemyss Malts, the brand has undergone a major refresh, led by a new name – ‘Darnley’s Gin’. Beautiful new packaging also celebrates the spirit’s quality and craftsmanship, with a rich colour palette and hand-drawn illustrations to convey the different botanicals in each expression. The story continues with the unveiling of an elegant addition to the portfolio, which currently includes Darnley’s Original Gin and Darnley’s Spiced Gin. A new Darnley’s Spiced Gin ‘Navy Strength’ is inspired by the illustrious career of Sir Rosslyn Wemyss, an ancestor of owners the Wemyss family, and an Admiral of the Fleet who commanded ships all over the world in the early part of the twentieth century. Finally, to reinforce a commitment to growth and the future success of Darnley’s Gin, the company has confirmed that they are in the final stages of building a new Darnley’s Distillery next to their sister whisky distillery at Kingsbarns in the East Neuk of Fife. Currently distilled in London, Darnley’s Gin production will move exclusively to the new Scottish facility this summer. The new Darnley’s Distillery is being developed in a disused cottage in this secluded corner of Scotland, and plans for an intriguing new visitor experience to add to Fife’s flourishing food and drink tourism scene are set to be announced within the next few months. Darnley’s Gin is a premium award-winning, small batch London Dry Gin that is crafted with almost two centuries of the Wemyss family’s expertise in distinctive, high quality spirits. Each expression is masterfully distilled in a time honoured style, with the finest grain spirit. Darnley’s Original Gin: inspired by the elderflower growing wild in the grounds of the Wemyss family castle in Fife, this elegant gin uses a distinctive blend of six botanicals including elderflower, coriander and lemon peel, creating a classic juniper-led gin which is fresh, floral and vibrant. Bottled at 40%. Darnley’s Spiced Gin: sparked by the Wemyss family’s spirit of adventure, this gin uses a distinctive blend of ten botanicals including cloves, ginger and grains of paradise. Contemporary in style, it is full and rounded with warm spice notes from cinnamon and nutmeg, followed by a lingering peppery finish. Bottled at 42.7%. Darnley’s Spiced Gin ‘Navy Strength’: During their time at sea, ships’ officers used to enjoy a daily ration of gin which had to pass a gunpowder test to prove it was over 57% alcohol and therefore ‘Navy Strength’. This gin uses the same botanicals as Darnley’s Spiced Gin, with a touch more juniper and an increased proof for a bold gin with intense warming spice flavours. Bottled at 57.1%. 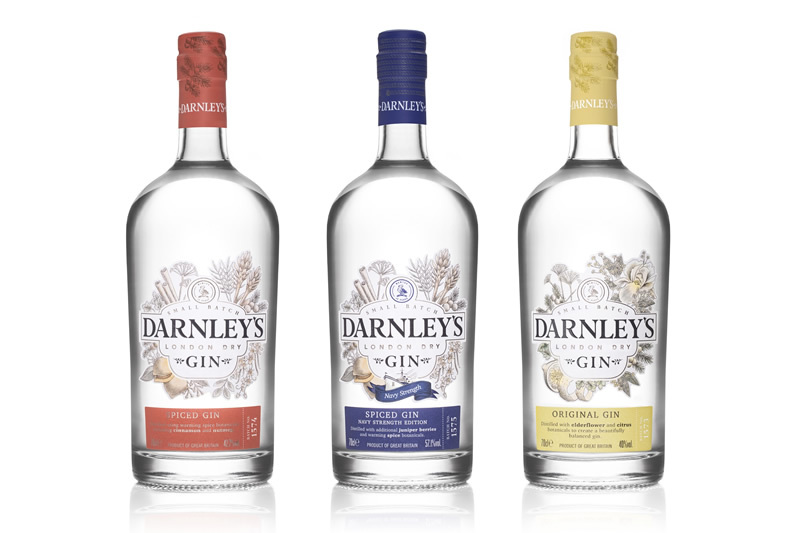 The new look Darnley’s Gin will be phased into the brand’s 23 global markets throughout 2017, led by the UK where it will be available from April in the on-trade and in specialist independent retailers and Majestic Wine. Darnley’s Navy Strength Gin will be available exclusively on Gin Kiosk from 3rd April – 3rd May and has an rrp of £39.99. Glasgow based design agency D8 worked with Darnley’s Gin to create the colourful new packaging, with UK illustrator, Martin Hargreaves, drawing the botanicals which beautifully represent the flavours of each expression.